All lands you control become 1/1 creatures until end of turn. They're still lands. Return target creature card from your graveyard to the battlefield. You lose life equal to its converted mana cost. I really like cards like Teferi, Mage of Zhalfir , Necrotic Ooze and Alchemist's Refuge . If you like the Basalt combo, I can highly recommend you Aphetto Alchemist . Also Life / Death , it can be really helpful after a board wipe. What exactly does Riftsweeper here? vdiddy1 on I hope this will be good. Traverse the Outlands fantastic, can this be turned into a win condition? 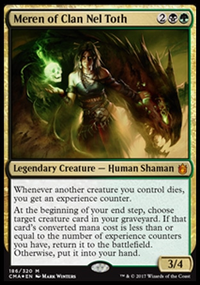 Your non-creature game is strong, but your damage output is weak and is currently the biggest flaw facing your deck. 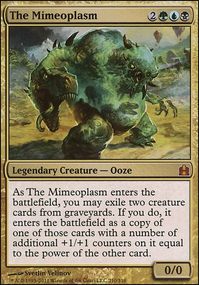 Your best bet imo is to either rip out creatures and synergize removal + damage or add in a few more big trample creatures. I think your comparative advantage lies in creatures: you'll consistently have an ungodly mana pool to take advantage of them, and you're already relying on creatures for this concept to work. I think you're going about the Karador package all wrong. Where is Grand Abolisher ? You have access to the fastest tutors in the game with black, green, and white. You're not running Enlightened Tutor . This deck can be one of the fastest decks around. It can compete with Prossh and Breya. It should be the longer the game goes, the stronger this deck gets because the ability to cast Karador cheap late game. To be honest, I rarely ever cast Karador. I use Karador for the colors only. Stack the deck with as many tutors you can. Don't skimp on the reanimator package, especially the 3 Dance of the Dead , Necromancy , Animate Dead , and Life / Death . Those are you bread and butter combo peaces. White has tons of tutors for enchantments. You want cards that can dump any card or creature into your grave. The whole dredge ability is too slow. Razaketh, the Foulblooded + Leonin Relic-Warder + Animate Dead / Dance of the Dead / Necromancy = Win by having Leonin target Animate, which you can sack Leonin to Razaketh which in turn brings back Animate Dead starting a loop. Goes infinite with any free sack outlet. Use cards like Blood Artist to to win. Of course Raz is hell to cast, but you cheat him out to your graveyard and animate him. He's a combo piece all by himself. Step 3: (You can do this combo with any reanimator spell) Cast Loyal Retainers / Necrotic Ooze / Karmic Guide to bring back or copy Razaketh's ability. Step 4: Once Razaketh is on the battlefield, use his ability to fetch Life / Death . You cast the Life spell from Life/Death for . Now all your lands become 1//1 creatures to sack to Razaketh. Use the lands to fetch Leonin Relic-Warder and Lion's Eye Diamond . Cast Lion's Eye for , now activate Lion's Eye by discarding your hand to gain , putting Leonin into your grave. Sack another land to fetch Animate Dead . Use the from Lion's Eye to cast Animate Dead and reanimate Leonin Relic-Warder, targeting Animate Dead with Leonin's ability. Now you have infinite tutors (you still lose 2 life from Raz for each tutor). This combo also works with Protean Hulk in the place of Leonin. You can now use cards like Auriok Salvagers with Lion's Eye for infinite mana. Feel free to ask for any advice or perspective, totally within my forte! Check out my other decks if ya like you might get a flash of inspiration somewhere along the line! I like the new look of your deck! Keep up the good work, man! Actually, I would like to support the suggestion from PookandPie about more fast mana lands. 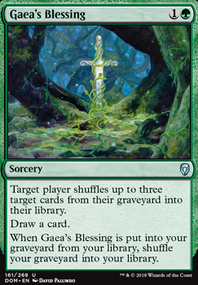 Even considering that you don't have many creatures in the deck, you should still have at least one green mana from Gaea's Cradle from game to game. And when in some games you will tap it for , or , you will be glad that you have this land. 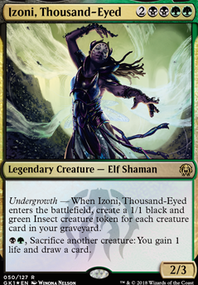 And you can use your Life / Death in conjunction with Gaea's Cradle to create insane ramp. Ancient Tomb - consider to add this card at least for the same reason why you use Mana Crypt , Mana Vault and Sol Ring , to cast key spells like Buried Alive and Ad Nauseam earlier. 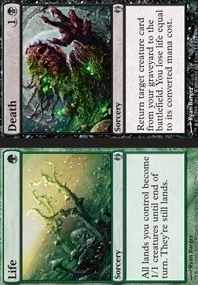 You can consider adding in more cards like Animate Dead , Dance of the Dead , Necromancy , Reanimate , or Life / Death to cheaply grab cards from your grave. Some also good inclusions are Grim Haruspex , Blood Pet , Satyr Wayfinder , Corpse Augur , Eldritch Evolution . Feel free to take a look at my version as well for some perspective! There are plenty of cards that are fun with Skullbriar. If you have trouble protecting him there are spells like, Vines of Vastwood or Blossoming Defense. Hope that helps!